I have mentioned before that I love thrifting. A good yard sale or thrift store makes me so happy. But a good one is hard to find, unfortunately. I think if I were in a bigger city, rather than a small town, it might improve my choices. 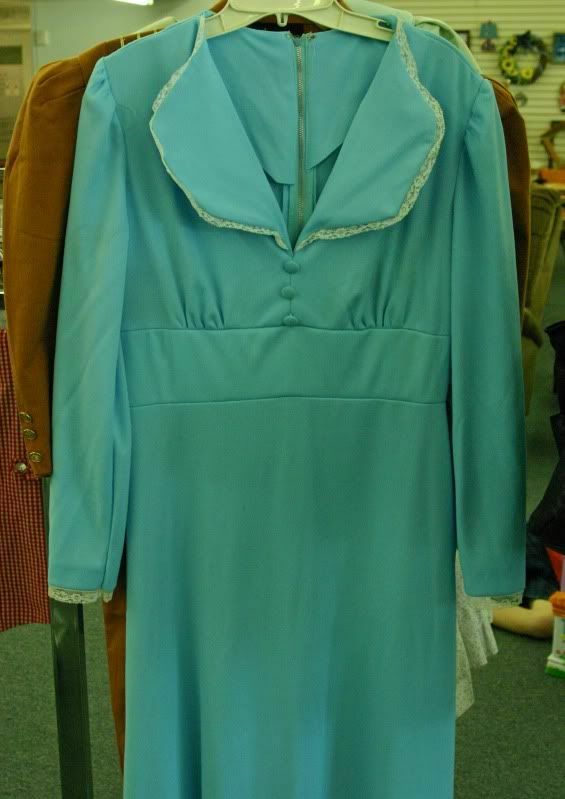 Full length, handmade, polyester, hanging on the front end of the rack because that's the prettiest thing on the rack. Wow. Or magazines. Lots and lots of outdated magazines. Not vintage enough to be good vintage, just enough to be laughable. I could totally rock a set of eyebrows like this. 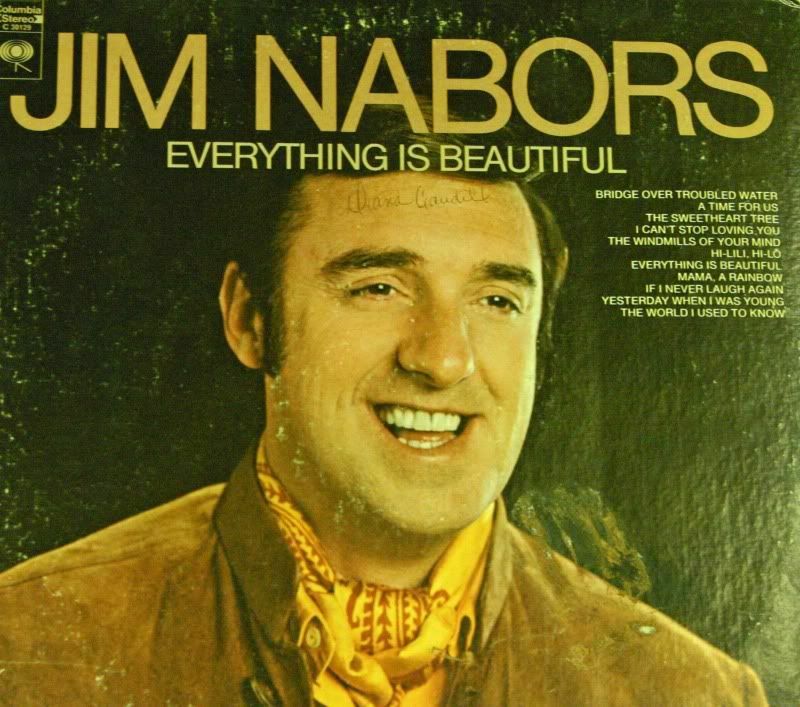 I find plenty of Jim Nabors albums. Because, you know, they're so desirable to collect. This one made me laugh and be thankful that I had my camera on me. "Music to Watch Girls By" ?? Creepy! And check out his eyes in the middle. Yikes. At the bottom it says "If You Go Away" ... What?! If I go away, what? You'll find me? You'll peer through my windows with those eyes?! I'm always impressed by people like Rhoda, Sarah, or Jen who can grab such great yardsale finds. Because the above list is more common for me. And yeah, you could totally rock those bushy hairy eyebrows. Yes, the ones on the women. 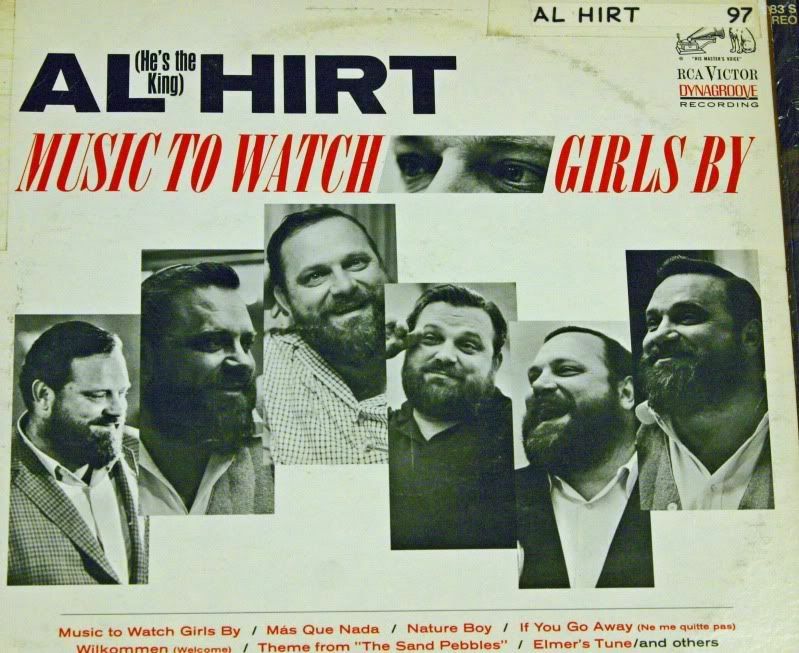 Must your mind always go back to Al Hirt? Hahaha. I saw that blue dress and thought "OMG Beki has horrible taste!" Relieved that you were joking. Whew. Thanks for the laugh, Beki. And... you've reminded me why I don't go to garage sales, everyone else finds the good stuff but me! i would SO love to go thrifting with you!!! i have a new found love for a good thrift store! That album is so funny...yet so creepy. =) Thanks for the laugh today! My one moment of fashion DO (opposed to fashion DON'T): Once I thrift-store-shopped and found the coolest retro acid green polyester vest. It was wicked cool. I was wearing it out one day and this fashiony woman walked by and said "Did you buy that at Nordstrom for $35?" I said, "No, the thrift store for $3.50." Tis the only moment someone has been jealous of what I was wearing. Too funny! While I too love thrifting, even better is FREE! I am so with you....I love love love garage sales and thrift stores and get the biggest kick out of some of the things in them. Gotta say don't think I have ever seen anything as creepy as the Record. love thrifting too. I find some cool stuff like a frosted glass and silver/chrome/stainless steel cake stand i found a few weeks ago. I'm so lucky (ish) that I live in a community of all three forces ... army, navy and RAF and so the base has a thrift store that is literally *one minute* walk from my house. It's only open on a Wednesday but half my wardrobe (I mean "floor-drobe) comes from the thrift shop! Items not sold in the main part get put on a rail for one week and then if they don't sell they get bagged and donated to charity. Those things in the charity room cost 30pence (about $0.50) and I have been known to get complete outfits for £1 ($1.50) !!! I can't really do thrift stores or garage sales. They end up being a waste of my time! Thanks for commenting on my blog. You'll have to tell your son thanks--that's a huge compliment! music to watch girls by??? Thanks for doing the REAL Thrift store photo shoot. This is what I find too. Maybe we just live in the wrong places or we just give up before we find that really fabulous item! I don't know but my results are much more like yours than Jen's! That vintage dress is spectacular. My sister-in-law and I went thrifting a couple of days ago and we had so much fun trying on and buying dresses. They sure don't make them quite like they used to! OMG!! I am laughing so hard I am crying. That album is scary!